The MIDI Manufacturers Association organized at NAMM a discussion around the HD protocole they’ve been working on for several years. 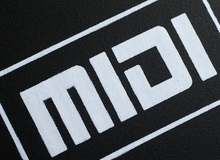 The new High Definition protocole is not a MIDI v2.0 but a new concept that is similar to MIDI and could be used along with MIDI. According to the MMA, this enhanced communication protocole would allow for capturing performance with greater accuracy, increase the number of channels and controllers (thousands announced) and note descriptions, which opens new expression capacities, think pitch and articulations. It should also support connection management (system configuration and recall) and gives room to expansions for future innovations. The MMA adds that the HD protocole would be backward compatible with MIDI 1, would allow for plug and play network communication via USB and Ethernet, which makes integration easier for software developers and hardware manufacturers. This new HD protocole is still under development, but many manufacturers and developers have been invited to participate in the project. Evidently, we’ll closely follow the evolution of this new HD concept.